The path to good health isn’t always a straight line. Each Boomsday puzzle asks something different of you. Not surprisingly, these ones are concerned with survival. The goal of these puzzles are to make sure you end every single match at full health. That is easier said than done. But if you’re patient and know you’re sequencing, you’ll be fine. Cast Holy Light on yourself, then heal yourself with Forbidden Healing. Binding heal the Deranged Doctor to heal five. Flash Heal yourself for five more, then heal yourself with your hero power. Holy smite the Deranged Doctor and trade it into the Flamewreathed Faceless to get your health back. Play Truesilver Champion and cast Seal of Light. Attack with your face into the Corrupted Healbot and case Holy Light on yourself twice. Play Equality and trade the Silver Hand Recruit into the Corrupted Healbot. Cast both Holy Lights on yourself. Open with Crystalline Crangor to double your healing. Play Equality and trade the Silver Hand Recruit into the Corrupted Healbot. Cast Forbidden Healing on yourself. Run out both Priest of the Feast and Radiant Elemental. Once your spells are discounted, heal your face with your hero power and cast both Flash Heals on yourself. Shadow Word: Pain the Radiant Elemental to get the last bits of healing you need. Play Jinyu Waterspeaker, targeting yourself, and cast Reincarnate on the Mistress of Mixtures. Healing Wave your own face and Lightning Bolt the Mistress of Mixtures. This one also starts by playing Radiant Elemental and Priest of the Feast. Using elemental’s discount, cast Shadow Visions to find another Shadow Visions. Do that four times in a row. On the last Shadow Vision (when you’re going to zero mana) take a Flash Heal and cast it on your face. Though this is the first puzzle, it requires some finesse. First heal your face with your hero power. Next, play Topsy Turvy on Hoarding Dragon, hero power yourself again, and cast Shadow Word: Pain. Hero power yourself another time and heal yourself twice with both Flash Heals. Play a coin and cast Light of the Naaru on your face. Play a coin and use Voodoo Doctor to heal your face. All you need to do now is trade the Deranged Doctor into Booty Bay Bodyguard. Play Floop’s Glorious Gloop and trade both Wisp’s into a Haunted Creeper. With the mana, play both Wisp’s from your hand and cast Poison Seeds. Cast poison seeds again to get the mana you need to run out Tree of Life. Equip Zilliax on Flying Machine and attack Turret Mechanical. Play Blessed Champion on Flying Machine and attack Turret Sentinel. Cast Forbidden Healing on yourself. 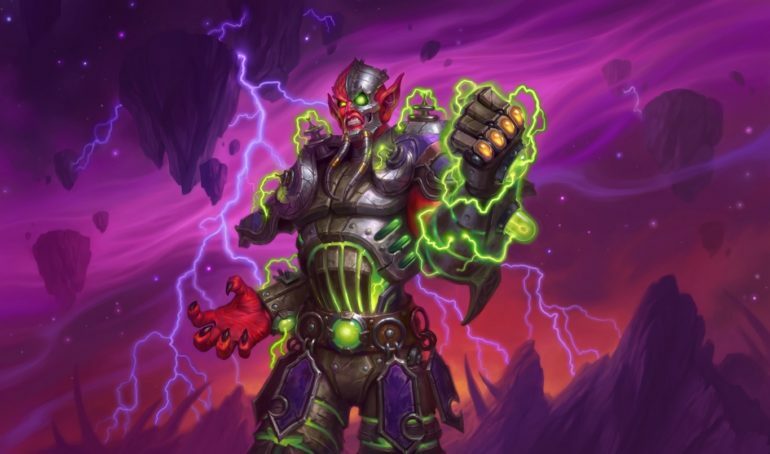 Play Steel Rager and magnetize it with both Glow-Tron and Zilliax. Next, attack the Steel Rager into Target Dummy and play Battery Pack to refill your mana crystals. Cast Forbidden Healing on yourself. Start this one off with Forked Lightning. To get more healing, play Murmuring Elemental and Refreshment Vendor. Lava Burst one of the Turret Sentinels to get your crystals back and then use the mana to cast Healing Wave on yourself and drop Antique Healbot. Play Shudderwock to win. Play both Ancestral Spirits on Corrupted Healbot so that it will come back twice. Eat Turret Sentinel with Moat Lurker, cast Reincarnate on the Corrupted Healbot, and play Unbeakered Lightning. Magnetize double Replicating Menace on Microbot. Attack it into Turret Sentinel and cast Spirit Lash. Attack one Rusty Recycler into Turret Sentinel. Then, cast Earthen Might on the Sentinel, buffing it to a 6/6, and play White Eyes away from the Flametongue Totem so that it does not get buffed. Put Rockbiter Weapon on the Recycler that has not attacked and kill the Sentinel. Cast Healing Wave on your face and get the rest of the health by using Jinyu Waterspeaker on yourself. This is another middle puzzle with a lot of steps. Start by casting Light of the Naaru on Auchenai Soulpriest, summoning a Lightwarden. Play Breakout and attack Soulpriest into Abomination. Cast Binding Heal on the Abomination and use Earthen Ring Farseer on yourself to heal for three. Run both Mistress of Mixtures and Tournament Medic into Abomination and then play Circle of Healing. Put Elixir of Life onto Lightwarden, attack into the Abomination with Light Warden and then hero power to heal your face. Play Brrrloc, targeting a Turret Sentinel. Drop down Hallazeal and cast Reincarnate on the non-frozen Sentinel. Play Ancestral Spirit on the non-frozen Sentinel and eat it with Moat Lurker to get quite a few minions on the board. Cast Unbeakered Lightning and Hallazeal’s power will put you to full health. Play Zilliax and buff him with Blessing of Might. Use your remaining mana to play Forbidden Healing on Primalfin Champion. Run the Mana Addict into Bronze Gatekeeper and slam Primalfin into Turret Sentinel (getting your Forbidden Healing back). Finish of the Sentinel by attacking Ziliax into it. Use your new mana to cast Forbidden Healing on your face. To finish this round of puzzles you open Wickerflame Burnbristle. After both Turrent Sentinels attack it, Moatlurker one of them. Magnetize Steel Rattler onto your Microbot and then cast Lay on Hands, targeting yourself. Trade the poisonous Microbot into the fully healed Turret Sentinel and play Uther of the Ebon Blade. Attack the last Sentinel with your weapon. Cast both Lay on Hands and Holy Light on yourself. To win this one, you need to become Jaraxxus. Achieve that by casting Phasing Portal on Jaraxxus and then playing Demonic Research. From there, Lifetap and play Jaraxxus. To begin, eat a Turret Sentinel with Moatlurker. Play a Glowstone Technician into Grimestreet Outfitter and cast Wickerflame Burnbristle (causing the Sentinels to attack it). Drop down the Paragons of Light and everything will die. First, play Tentacle of N’zoth and then trade the Nerubian Unraveler into the Sentinel. Now that your spells are reduced, Entomb Jaraxxus and cast Silence on Nerub’ar Weblord (to unlock your minions). Kill the Mana Wraith with Elven Archer to get the last of your mana back. Play Bright-Eyed Scout and cast Jaraxxus. Cast Demonic Research and play Dark Pact on Sylvanas. Drop down Spiritsinger Umbra and use Carnivorous Cube to eat you Mistress of Mixtures. You then want to Dark Pact your Carnivorous Cube and play Cataclysm. For the final healing puzzle, play Mistress of Mixtures and Demonic Research. Then use Phasing Portal to shuffle Jaraxxus back into your deck. Play Voidripper, cast Sacrificial Pact on it and run out Chillmaw. Dark Pact Chillmaw to trigger it’s deathrattle and Alextrasza your own face. Play Witchwood Piper to draw Jaraxxus and then play the demon lord to solve the puzzle.